“For six months, from June to December, 1956, they gave me the run-around. Up until this minute, I have received no satisfaction from the Maryland CAP. Neither have I received any squadron assignment in the state of Maryland. The Rev. Mr Carroll has been flying for five years and has 1500 hours to his credit. His private plane is at Harbor Field. He earned his wing in July 1952 at the Tuskegee Alabama Air Force Base where he was attached to the Tuskegee Squadron of the Alabama Civil Air Patrol. HOWEVER, the Rev. 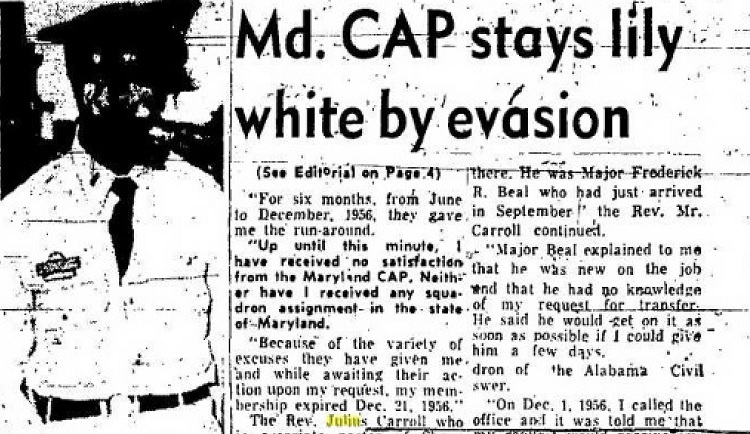 Mr. Carroll moved to Baltimore in June 1956 to assist his brother, the Rev. Edward Carroll at the Sharp Street Church. “After the Maryland Wing gained possession of the 201, the next step would have been to assign me to a squadron here,” the Rev. Mr. Carroll said. He was Major Frederick R. Beal who had just arrived in September,” the Rev. Mr. Carroll continued. “Major Beal explained to me that he was new on the job and that he had no knowledge of my request for transfer. He said he would get on it as soon as possible if I could give him a few days. “In the meantime, I did not send a renewal fee to the Alabama CAP at Tuskegee because I had moved out of its jurisdiction,” Mr Carroll said. The Rev. Mr. Carroll also stated that plans were under way at the Sharp Street Community House to set up a CAP Cadet Squadron as part of the recreation program for the young people. HE ALSO stated that the CAP practice of not allowing colored children to join would greatly handicap the Community Center program. I would refuse to activate a segregated unit in my community program,” the Rev. Mr. Carroll said. Early Wednesday morning Col. J. H. Griffith at CAP national headquarters Bolling Air Field advised the Rev. Mr. Carroll to write to the Alabama Wing and request that his 201 file be sent to the Maryland Wing Headquarters, Col Griffith also said that he would personally communicate with Col Fonda of the Maryland CAP and advise himt to take “favorable action” on the request for membership. Be the first to comment on "Maryland Wing Civil Air Patrol Stays Lily White by Evasion"